One of the most notable things about Italian football is the passionate fans, none more so than the ultras of the small, provincial club Hellas Verona. Despite the city being associated with Shakespeare, Romeo and Juliet and love, there is a darker subculture in the Curva Sud (the curved stands behind either goal) of their Stadio Marc'Antonio Bentegodi (side note, one of the most depressing stadiums in Italy). Go to any match in Italy and you'll notice the Curva Sud. Image from Wikipedia. With only 1 scudetto to their name back in the 1984/5 season, the fans really do push the club to achieve greatness. Let’s start with one of the most infamous groups in all of Italian football, Brigate Gialloblu (Yellow & Blue Brigade). It’s hard to talk for too long about Brigate Gialloblu without mentioning their vicious reputation. Often called “the most racist fans in all of Italy”, Brigate Gialloblu are incredibly fearsome, often inciting horrifically abhorrent chants and banners. Rarely, some are incredibly amusing, none more so than their now famous “odiamo tutti” (we hate all) banner, showing their disdain for no particular group. Officially disbanded in 1991, the group still lives on in spirit today, their hate filled chants and banners sometimes making an appearance. Hellas at their absolute peak, ably supported by their fans. Image from Wikipedia. Founded in the 1960’s as a left wing student group, the political chaos of Italy in the 1970’s shifted them to the far right, a place they have rarely drifted from since. From throwing bananas at black players, to groups of fans showing the Roman salute (aka the Nazi salute), it's hard to have a soft spot for them. After heavily damaging the smaller city of Brescia in 1986 after a game, it was hardly a surprise that they had to be disbanded, especially in a world where this level of ridiculous abuse was no longer to be tolerated. Sadly though, this type of racial abuse wasn’t only limited to the Brigate Gialloblu, with ultra groups from Lazio spouting a similar level of hatred, causing Aron Winter to leave the club specifically due to the racial discrimination and offence he’d received from his time at the Roman club. Brigate Gialloblu weren’t only racist to those of different skin colours however, they were also racist to other Italian’s, notably those from the south (with a certain insult being regularly used, which roughly translates to land lover). Meaning the Veronese are all mad, Veronesi tutti matti is a rather apt slogan for Associazione Stalle Umane (Human Stable Association), an infamous subsect of Brigate Gialloblu. 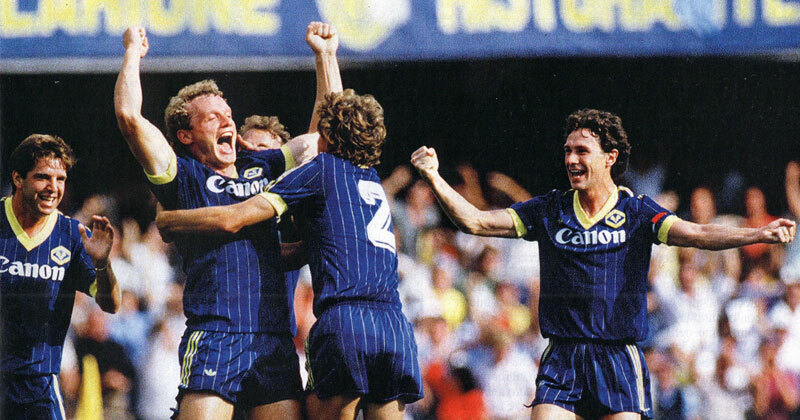 The groups success was symbiotic with the teams in the mid 1980’s, and they regularly travelled around Hellas’ European matches, wreaking havoc wherever they went. 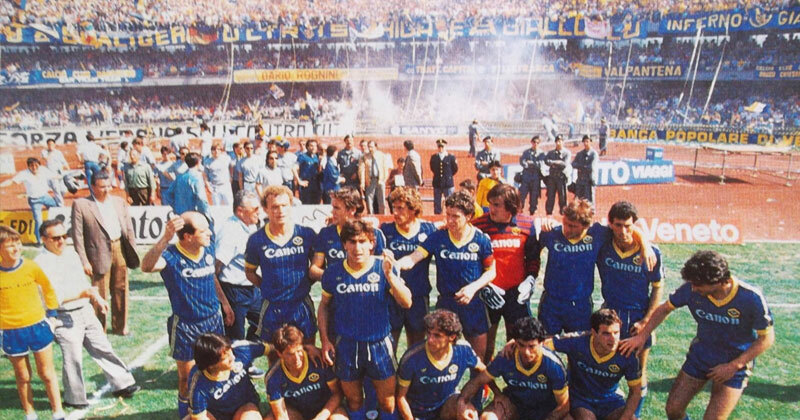 However, due to the risk of Brigate Gialloblu being branded a terrorist organisation, clashes with Milanese fans in 1991 forced the leaders of the group to decide to disband. 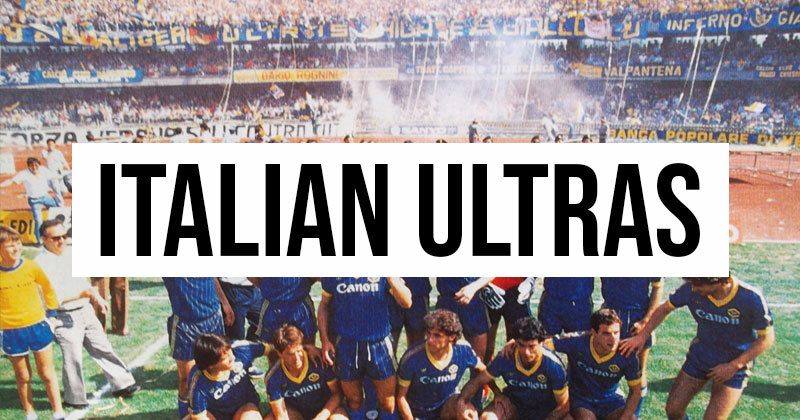 Although officially disbanded since then, Brigate Gialloblu lives on in spirit, with the ultras of the club still as passionate and infamous as ever. Since the dawn of the 21st century, Hellas Verona have found themselves struggling. Not only were they relegated down to Serie B at the end of the 2001/02 season, they even managed to drop down to Serie C1 in 2007. This period was one of the darkest in the history of Hellas, made even worse by the fairytale story of their city neighbours, Chievo Verona. 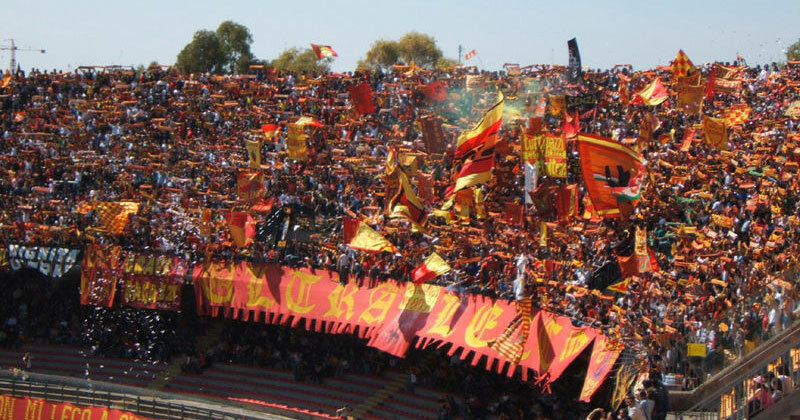 Despite this, the undying love the tifosi have for the club is incredibly apparent, just by looking at ticket sales alone. 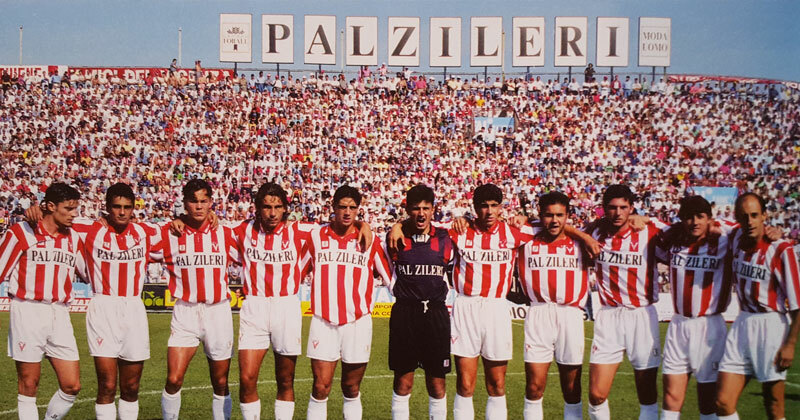 During their time in Serie C1, the average number of ticket sales for a club was 2500. Hellas would sell at least 10,000 season tickets alone. Finally, in 2011 Hellas would find themselves back in Serie B, and only 2 years later they would join their hated brothers Chievo in the top flight again. The dedication the fans showed during these dark days is just one of many examples of the relationship between the ultra groups and their club. A story of love, anger, hatred, passion and lifestyle. In the red corner. Image from Wikipedia. Despite what you might think, Hellas’ rivalry with Chievo is not the biggest in their eyes. This is mainly due to the lowly status of Chievo for essentially all of the 20th century. No, instead their biggest rival is the now struggling L.R. Vicenza Virtus. Vicenza is a smaller city also in the Veneto region, and their rivalry is shockingly heated. First meeting in 1906, the two have been playing against each other for over 100 years now. Since then, Verona barely edge out their opponents on paper, with 1 more win (36 vs 35), and a total of 25 draws. One of the best ways of understanding this rivalry is by looking at one old Veneto saying. Veneziani gran signori, Padovani gran dottori, Vicentini magnagati, Veronesi tutti mati. This largely understated derby is not one many fans look out for, but for the fans of Hellas Verona, and the ultras especially, it becomes one of the most important fixtures of the season. Will Hellas fans ever see a return to the glory days? Image from Wikipedia. Sadly, with both teams struggling, it's unlikely we’ll get to see this derby any time soon. However, for the locals and the police alike, it's probably for the best. As once said by La Gazzetta dello Sport, “These fans of Verona are a report of terror”, showing that whilst Hellas Verona might not be the biggest, or most successful club in Italy, the ultras are not to be underestimated, even in the ever increasing climate of “commercial football”.